Tooth luxation is the displacement of a tooth from its normal position due to severe trauma. A luxated tooth needs to be stabilized with a wire or composite splint and possibly receive root canal therapy within 24-48 hours. If the tooth is fully displaced from the pet it should be placed in milk until treatment options are discussed. Stabilization and root canal therapy. Schedule an appointment today to have your pet evaluated for any luxated tooth. Tooth luxation is a condition in which a tooth is displaced from its normal position. The pet should be treated for pain and referred for therapy. 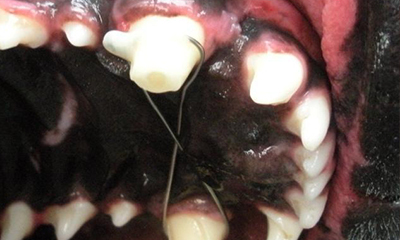 If the tooth is fully displaced from the pet, it should be placed in milk until treatment options are discussed. 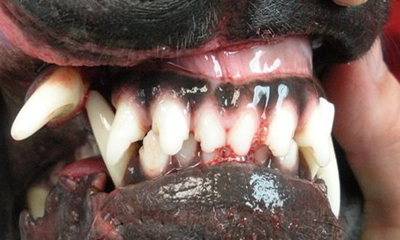 These pets need the tooth to be realigned and stabilized as soon as possible. Once stabilized (wire or composite splint) the tooth will receive root canal therapy to save the tooth.